Beware of the word “rare”. One of the most satisfying aspects of growing Brugmansia is growing them from seed. Compared to many other plants, Brugmansia has a relatively fast turnover rate. Plant a seed, and you have a flowering plant within 12 – 18 months. That’s pretty fast when you consider something akin to an amaryllis bulb takes three years from seed to flower. If you aren’t interested in the outcome of the Brugmansia seeds you plant, buy OPEN POLLINATED SEED. When seeds are open pollinated, it means the flower was randomly pollinated by insects, the wind, or accident. The resulting seed has a high probability of NOT resembling the pod parent (the plant that actually made the seed pod). Usually, the ad for these seeds will describe them as open-pollinated, but not always. If they do not list a specific pod parent and pollen donor – EX: (Charles Grimaldi x Tiara), they MUST be considered open-pollinated. Or, if they list just the pod parent and NOT the pollen donor – EX: (Charles Grimaldi x ????) – they must be considered open-pollinated. OPEN POLLINATED Brugmansia seed is good for those who just want to play around with growing Brugmansia seeds, or have a lot of land and time they want to waste for growing. Because it is worthless to the serious hybridizer, and should only be considered for recreational growing, you shouldn’t pay more than .99 for a pack of ten seeds. Postage for the purchase should be no higher than $1.44 for up to 3 packs. If you are very interested in the outcome of Brugmansia seeds, you should consider purchasing SEED CROSSES from reputable Brugmansia hybridizers. Making deliberate decisions about which plants may likely produce envisioned results is their expertise. 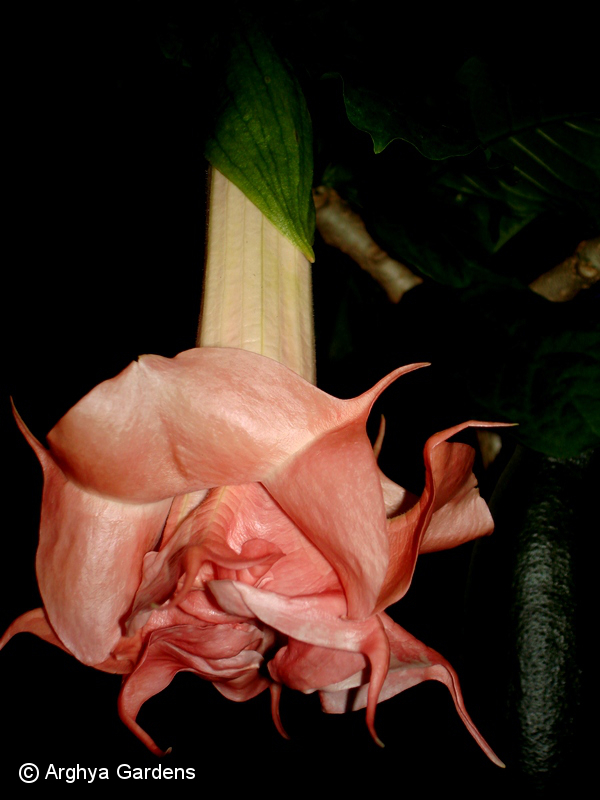 Over the years, they’ve studied Brugmansia and the pollens they produce. They know which pollens more likely influence the outcomes of their crosses. It is wrong to suggest that cross pollination, whether open or planned will produce the same number of likely successes. The selection of pollens HEAVILY influences the likelihood of successful blooms. When the insects do it, it’s like putting a quarter in a slot machine hoping you’ll win the jackpot. When an experienced hybridizer pollinates, it’s like personally knowing the dealer at the Blackjack table. The odds that you’ll hit the jackpot are more highly in your favor. The pollens that Brugmansia produce are NOT ALL THE SAME. Some have pollens that heavily influence fragrance, color or the likelihood of multiple coronas. Some pollens have little effect other than to induce white, single blooms. Insects don’t know this – professional hybridizers do. That knowledge comes from years of observing and working with many Brugmansia cultivars and cataloging the results. Its called wisdom – something a bee or wasp can only hope for. When you purchase seed from a professional hybridizer, you’re going to pay more for them. They are listed with the names of the pod parent AND the pollen donor – EX: (Charles Grimaldi x Tiara) – right in the ad. If you’ve observed the sale of cross-pollinated seed from professionals on eBay or anywhere else, you’ll notice that they are auctioned and fetch high prices. The bidders know the secret. They know the seeds they’re bidding on are the result of SELECTIVE BREEDING – NOT OPEN POLLINATION, and are more likely to produce an outstanding outcome. You can expect to pay anywhere from 4.75 for a 10 pack of such seed, to as high as $30.00. Postage, unless they come from overseas, should be no more than $1.44 for up to three packs. Be a smart Brug seed shopper! You just might have the next, spanking new, super-beautiful Brugmansia if you do!